If you’re in the market for new gutters, you’re likely overwhelmed by the choices. At Minnesota Leafless Gutters, we understand that the process of buying new gutters can be incredibly intimidating. There are a whole host of different styles and materials to choose from and it’s hard as a homeowner to know what to choose. At Minnesota Leafless Gutters, we’ve been installing high quality gutters for more than 17 years. We attribute our longevity in the industry to our commitment to provide the highest level of customer service as well as our focus on utilizing only the highest quality materials for each project that we complete. 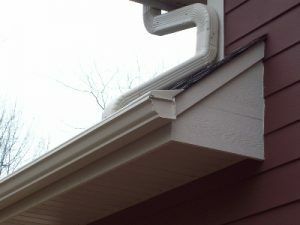 How Do I Know What type of Gutters are Best for My Home? Gutter technology has improved drastically over the past few decades. This is good news for homeowners because it means that the gutters you purchase today are much stronger and more versatile that the gutters you’re likely replacing. At Minnesota Leafless Gutters, all of our gutters are considered ‘seamless gutters’, which simply means as you would imagine that there are no seams in any of the gutters. These seams can collect debris and make your gutters clog much easier than our seamless gutters. In addition to choosing seamless gutters, we also recommend our gutter cover systems, which ensure that your gutters don’t become clogged, which can result in major damage to your home, especially during the harsh Minnesota winters that we’re all so used to experiencing. It’s our opinion that our seamless gutters in combination with our gutter cover systems are the perfect choice for any customer looking to upgrade the look and function of their existing gutters. We offer three types of metal when it comes to new gutters: aluminum, steel and copper. Whichever type of metal you choose, we’ll always use the highest gauge steel to ensure your gutters will stand up to the harsh Minnesota weather. Many other gutter installation companies will attempt to use thinner gauge steel, which can quickly become damaged. If you’re unsure of the effectiveness of your current gutters, feel free to reach out to our team today for a free gutter inspection and consultation. At the conclusion of this meeting you’ll have a good idea about the quality of your current gutters as well as your options when it comes to new gutters. We’ll offer a variety of options based on your budget as well as your needs. Give us a call today at 612-221-0362 to setup your free consultation.